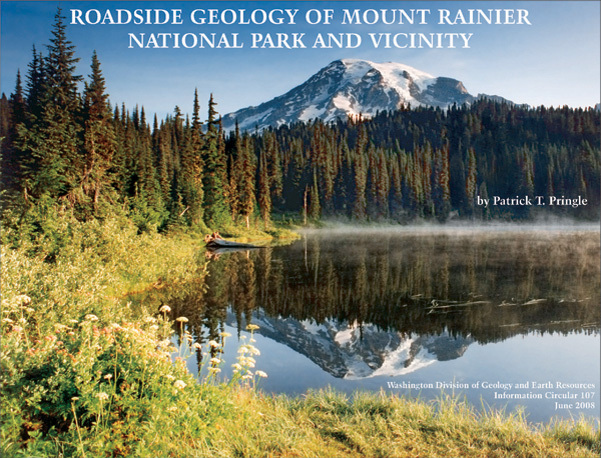 “Roadside Geology of Mount Rainier National Park and Vicinity” is an up-to-date book on volcanic processes past and present in the Pacific Northwest, illustrating both the beauty and the hazards of our state’s largest volcano. This book covers an area bounded by I-5 on the west, State Route 410 on the north, Yakima on the east, and U.S. 12 on the south. This 200-page, four-color book is written for anyone with a basic understanding of geology and is designed for ease of use, with a landscape format and spiral binding. Part III consists of a glossary, references, and other useful information. The book contains more than 290 photos and illustrations, some of them historic, most of them in color. It was funded in part by the National Scenic Byways Program of the Federal Highway Administration. Pringle, also the author of the “Roadside Geology of Mount St. Helens" (Information Circular 88), worked at the U.S. Geological Survey’s Cascades Volcano Observatory for 8 years during and after the 1980s eruptions of Mount St. Helens. He was with DNR for more than 15 years before taking an Earth Sciences teaching position at Centralia College in 2005. Contributing authors include some of the leading experts on the volcanic history of the Pacific Northwest. Above description quoted from the Washington Department of Natural Resources (WA DNR) Web page for this book where you can download it for free or purchase the book for $17.95 plus shipping. You can also download book as a single file or individual sections from WA DNR's Web page or from list below. You can get the latest errata sheet for the book. Note.-- People using Apple's Safari browser, should use the right click to save the file or download it from the alternative Website. People using Mozilla's Firefox browser will get a pop-up window asking for instructions for the file. That's the book. You can also buy it from DNR's Website, which I also did. It's a great spiral-bound book easily suitable for travel. You can check out the author's, Patrick Pringle, Web page for addition information about the book and the award he recieved with the book. The last section, part 3 (above), has about 25 pages of references, Websites, glossary, description of geologic map units and a list of geologic terms. It alone is a great resource.